Continuing from the last post where I provided a detailed overview of how a person can plan a trip to Dharamshala and Mcleodganj; in this article, I will talk about places to visit in Mcleodganj and several activities that you can indulge yourself in as a tourist. Details below will include information like where these places are located and how you can use the time in hand to explore the most. Some of these tourist attractions are located within Mcleodganj while others will require you to drive or trek for a few hours. How many you were able to cover will entirely depend on the time you have in hand but 2 to 3 days is usually considered as an ample amount of time to plan a visit to Mcleodganj. Mcleodganj is one of the most visited tourist places in all of Himachal. As a matter of fact, I think it will be next on the list after Shimla and Manali. It is one of those places where it never truly is the off-season. Irrespective of the month and season of your visit, you will always find tourists in Mcleodganj and quite a vast variety of them. This small town serves as a perfect destination for family vacations as well as an adventurous one. It also works great for people looking forward to a budget trip or a quick getaway over the weekend. There is a whole lot of places and activities here to keep you occupied for days, weeks even. The only thing that will limit you in Mcleodganj will only be the time that you can afford. I will begin with first listing down all the tourist attractions in Mcleodganj followed by a brief description of all of them. After covering places to visit, I will then talk about some activities and other fun things to do in Mcleodganj. This waterfall is probably the most visited tourist place in all of Mcleodganj. It is located in the village of Bhagsu in upper Mcleodganj and can be reached by 3 kilometers long trek. Though the trek may sound a little long to some people, it is actually more of a fun walk that even elders and children can complete easily. Starting from Mcleodganj, you will first reach Bhagsu Nag temple after 2 kilometers long trek and then continue walking to the waterfall for another 1 kilometer. It is in fact only the final stretch of this trek that can seem a bit difficult to some people but there are tea shops and small eateries along the trek where you can take short breaks. The waterfall is about 20 meters tall and is known for its lush green surroundings and mesmerizing scenery. You can enjoy the pleasant walk, click pictures of the beautiful vistas around and take a dip in the waterfall. It is a perfect trek for people of all ages and groups. Most of the tourists end the trek at the waterfall and return to Mcleodganj from here but if you were up for it, then you can continue even further to Shiva Cafe; details on which I have covered further in the article. Bhagsu Nag Temple is an ancient 18th-century temple and falls on the way as you trek to the waterfall. It is dedicated to Lord Shiva and there are a couple of legends related to it. One legend says that Lord Shiva visited and blessed the spot himself in ancient times due to which this temple was built and dedicated to him. As per another legend, the temple was built by King Bhagsu to honor the snake god. Surrounded by coniferous forests, towering hills and a beautiful waterfall a kilometer away, the location of the temple is quite scenic and it is among the most visited places in Mcleodganj. It’s stone walls are covered with beautiful carvings and inscriptions. There is also a pool in the temple which is said to have been built by the Gurkha rulers originally. Tourists are allowed to take a dip in the pool but it does get a bit crowded here sometimes. Coming from Mcleodganj, you will first reach Bhagsu Nag Temple and then Bhagsu Nag waterfall. Most people return from here and you could too but if you are up for a bit more of trekking, then you can continue further to Shiva Café. It is actually just a small café but I am listing it as a tourist place because of its location. Trekking to the cafe will have you walk on a not so well laid out path and it does get a bit rough at a few spots. But the location of the cafe and the food here will make it worth the effort. It is a good spot to sit and relax, have something to eat and click great pictures with a great background. Next in line for tourist places in Mcleodganj would definitely be the Triund Trek. It is counted among the top trails in the country and considered as the crown jewel of Mcleodganj. While the short trek to Bhagsu Waterfall is more of a family affair, it is Triund that rules hearts of anyone looking forward to some serious trekking and possibly camping as well. Please note that though I said “serious trekking”, the difficulty level of Triund is more on easy to intermediate side. As long as you are fit enough to walk for a few hours, you will easily be able to complete it. The total length of the trek is about 7 kilometers that will take you to the top of the peak where you can stay for the night either in the camps or the HPPWD rest house. That is correct, there is cemented accommodation available here as well but you will have to book this in advance. Please read How to Book HPPWD Rest House for more details on the topic. The entire length of the trek is marked with lush green vistas all around, cloudy trails, views of several Himalayan peaks of Dhauladhar range, sightings of rare birds and herds of grazing sheep. I have covered the topic of Triund Trek in details at another article, How to Plan your Trek to Triund. If you have the time and the stamina, Triund trek in Mcleodganj is not to be missed at any cost. However, there are a few places where the trail gets a bit steep and it is not advised to attempt it with family including elders and children. At places, you may even have to hope over some small boulders. As the name suggests, it is a popular spot in Mcleodganj to catch an amazing sunset view. It is located about 4 kilometers from the main town on Naddi road and is also known as Naddi viewpoint. The view at dusk from here is stunning. It is, in fact, two of my most favourite spots to catch a sunset view, the other one being Kali ka Tibba near Chail. As the sun starts to set, it would seem as if the entire sky has been set on fire. On one side, you will have the sun going down while on the other side, its rays will be turning the Dhauldhars peaks into a glowing orange. It is truly a sight that you must not miss while in Mcleodganj. Even if you were in the town for a day, you should still make time to be at this spot by the end of the day. Dal Lake, another tourist spot, too is nearby so you can cover both of the places together. This church was built in 1852, by Lord Elgin, once the Governor General and Viceroy of India. It is said that Lord Elgin visited Mcleodganj and was so mesmerized by the place that he even decided to make it the summer capital of India. He lived the final days of his life here and is buried very close to the church. The glass windows of the church were painted by a Belgian artist. The church is about a kilometer before you reach the main town and can even be visited while on your way to Mcleodganj or while returning. It is surrounded by lush green forests all around and is a must visit for anyone visiting Mcleodganj. I will personally recommend taking a short stop at the church. Even if you do not have interest in monasteries or Tibetan or Buddhist culture, a visit to Namgyal Monastery still comes highly recommended. Often referred to as “Dalai Lama’s Temple”, it is the personal monastery of the 14th Dalai Lama. The key role of this monastery is to assist with rituals involving the Dalai Lama himself. Its main tantric practices reportedly include those of Kalachakra, Yamantaka, Chakrasamvara, Guhyasamaja, and Vajrakilaya due to which it is also often referred to as Namgyal Tantric College. It is located at a distance of about 5 kilometers from Mcleodganj. This ancient fort is located about 25 kilometers from main Mcleodganj town, 20 kilometers from Dharamshala on the outskirts of the town of Kangra. It is among the largest forts in all of Himachal and probably the oldest dated one in India. There is a driveable road that goes all the way to the fort and you can find a bus as well if you went traveling by public transport. It was built by the royal Rajput family of Kangra State and had been subject to numerous wars and invasions throughout its history. The fort was heavily damaged in an earthquake on 4 April 1905 but still retains its royal and magnificent beauty. It is a must visit for anyone with interest in historical monuments, ancient architecture or even photography. The location of the fort too is very scenic at the confluence of Banganga and Majhi rivers. As per the local legend, the person who owns this fort owns the entire Kangra. There are a couple of other tourist places as well near the fort. The famous Jayanti Mata temple built on a hill top and Maharaja Sansar Chand Katoch Museum run by the Royal Family of Kangra too are well worth a visit. Masrur Temples, also referred to as Masroor Temples or Rock-cut Temples at Masrur, are another historical monument near Mcleodganj and often called as its hidden gem. It is a set of 15 temples carved into rocks and is an amazing example of fine architecture. These temples are among the least explored ones in all of Himachal and you will hardly find any tourists around here. The entire setting of the temple is amazingly scenic with Dhauladhar Mountains in its backdrop. These temples are what you can truly call man-made wonder and untouched natural beauty put together. If you want to visit an offbeat destination in Mcleodganj, then Masrur Temples is where you should go. 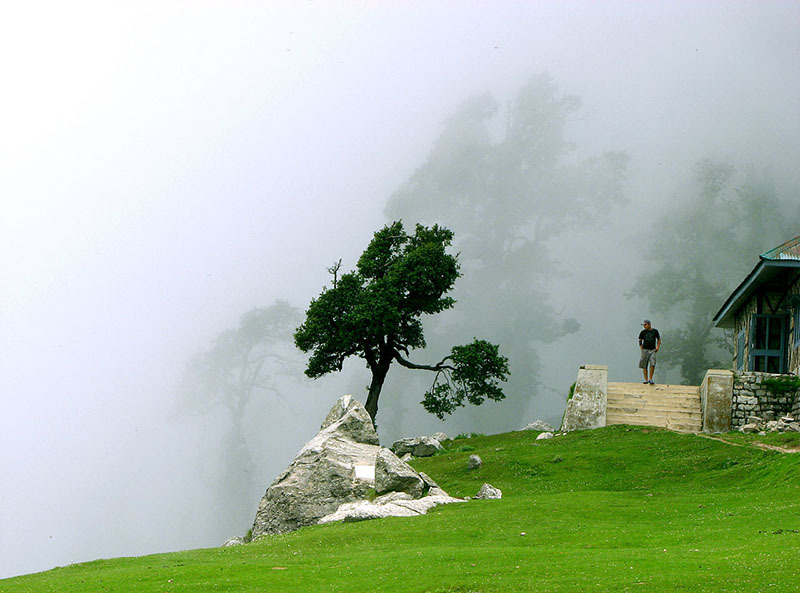 It is located about 50 kilometers from Mcleodganj and a visit here will require at least half a day. The Tibet Museum is located near the main temple of Dalai Lama and is a great place to visit if you want to learn about the history of Tibet. They have a collection of over 30,000 photographs depicting Chinese occupation of Tibet, the whole issue around human rights abuses by Chinese forces in Tibet; and the series of events that led to Dalai Lama’s exile. There is no entry fee to the museum and they also run a documentary on Tibet twice a day here. This is another place that you can visit to learn more about Tibetan Culture. They have some workshop sessions as well but it will cost you Rs. 50 as an entry free here (if you were not a Tibetan). For Tibetans, the entry fee is Rs. 20. As the name suggests, this small lake is named after a much larger and better-known one located in Srinagar, Kashmir. It is located about 4 kilometers from Mcleodganj near the village of Tota Rani. There is a small temple next to the lake dedicated to Durveshwar Mahadev, due to which this lake too is considered sacred. There is also a festival fair that is held here once every year. Boating in the lake is available and it can be a good spot to visit if you had children traveling with you. But it does get a bit crowded here as well. This temple is located at a distance of about 8 kilometers from Mcleodganj and 13 kilometers from Dharamshala; at an altitude of 2310 meters. The temple is dedicated to Goddess Kali and is a pilgrim center of the Gaddi shepherds. Completely surrounded by forests of oak and deodar, the temple gives stunning and close views of Dhauladhar Mountains. To get here, you will first drive to Naddi Village near Dal Lake and then walk the last 4 kilometers to the temple. It will take you about 2 to 3 hours to reach the temple from Mcleodganj and if you wanted to, you can even stay here for the night. The temple has basic dormitory type accommodation facilities providing mattresses and blankets for sleeping over. Kareri Lake is a high altitude, shallow, freshwater lake located at an altitude of 2,934 meters. It is fed by the melting snow from nearby mountain peaks of Minkiani and remains completely frozen during winter months. There is also a temple dedicated to Lord Shiva on a hilltop near the lake. It is a very scenic trek that will present you with some amazingly scenic and memorable vistas throughout the trail. Please note though that this trek will need about 3 days at least to be completed. The total trekking distance from Dharamshala to Dharamshala is about 28 kilometers. Kareri Lake also serves as a base for trekking further to Minkiani Pass (4,250 meters) and Baleni Pass (3,710 meters). If you are into trekking and have the time then you can continue to trek further after Kareri Lake towards the passes of Indrahaar and Minkiani. This will be a trek of at least 6 to 7 days. If done at a relaxed pace then this would be a 9 days trek ideally. Dharamkot is a small village about 8 kilometers from Mcleodganj. It is also known as a “Hippie village” because a lot of foreigners have taken residence here. On the crest of a hill above McLeodGanj, Dharamkot offers wide views of the Kangra Valley and mountains of the Dhauladhar range. There are a few restaurants and guest houses here and a lot of people prefer to head to Dharamkot instead because it is less crowded here as compared to the busy town of Mcleodganj. How many places you are able to visit will entirely depend on the time you have in hand. But if I am to list must visit places in Mcleodganj then Bhagsu Waterfall, Bhagsu Nag temple, Namgyal Monastery and Triund will be the four. These places can easily be covered in 4 days. Reach Mcleodganj on Day 1 and relax. On Day 2, visit Bhagsu waterfall; and temple and take a stroll through the market enjoying some local food and shopping. You can pay a visit to the monastery towards the later part of the day. On Day 3, climb up to Triund and return by evening. You will return home on Day 4. If you were, however, traveling with family then you will have to keep Triund out of the plan and you can replace it with either a visit to Kangra Fort or Masrur temples. After places to see, let me now talk about some of the tourist activities to do in Mcleodganj (apart from visiting all of the above mentioned places). This sounds like an obvious thing but I am still keeping it at top of the list. When you are in Mcleodganj, only focus on how you can make the best out of your time. There are plenty of places to visit here that I listed above and you should try to visit them all. Try things that you have never done before and let Mcleodganj become an experience that you will remember for a long time. Second in the list will be photography. Go click-crazy and shoot as many pictures as you can. You will be presented with ample opportunities to indulge in all kinds of photography including landscape, portrait, night skies, wildlife and much more. Triund will be the perfect place to go camping in Mcleodganj. You can either bring your own camping gear or check into any of the campsites at the top. Mcleodganj is a perfect place for shopping. And I am not talking about buying crazy expensive stuff. I am referring to small souvenirs, sculptures, Thangka paintings or trinkets that you can buy as a remembrance of your time there. Temple Road will be a great place to do some shopping. If you would like a less crowded and quieter place than try some sopping at Kotwali Bazaar. A trip to Mcleodganj is incomplete unless you have tried the local food here which is really a mix of Tibetan and Indian cuisines. There are several restaurants in the main town that serve some delicious continental dishes as well. What is more? You can even take cooking classes in Mcleodganj and add some Tibetan dishes to your own personal menu. Lhamo’s Kitchen and Sangey’s Kitchen are two such places that offer cooking sessions of authentic Tibetan cuisine for travelers. Tibetan Institute of Performing Arts will be the place to enjoy some grand shows on Tibetan Culture including folk dance and music. Occasionally, they also showcase Lhamo, a 6 hours long local folk opera. If star gazing is your thing that you would absolutely fall in love with Mcleodganj. The clear sky over the snow-capped peaks will be an absolute delight to watch. Om Yoga Center, Himalayan Iyengar Yoga Center, Universal Yoga Center, and Tushita Meditation Center are some of the local Yoga learning centers that you can learn Yoga at. There are also several Spa treatment centers in Mcleodganj that are popular among tourists. If you were traveling with your family then bringing your kids for a boat ride in Dal Lake is a must. They will love it here absolutely. That is pretty much it. These will be the top places to see in Mcleodganj. I am sure the list can be made a lot longer but that would required to spend several days in the town; more like making it a base and exploring the nearby areas. I hope the information above was of help. If you have any questions; or need any further details; please fee free to ask in the comments section below; or at our Community Forum; and I will be glad to answer. Itinerary for Bhutan(4-5 days)Sikkim(4-5days)some places in WB(2-3 days) ie Darjaling, Kolkata etc,stay at 3 star hotel.tariffs including itinerary and air fare from Pune/ Mumbai,child has 2 year old.tour starts at Pune/Mumbai and ends with same station.tour Date inbetween 2 nd Saturday to 4th Saturday of June.I am bank employee plan to go on LFC/LTC.Eagarly waiting for reply.